Mary Clap Wooster was the wife of Major General David Wooster and the daughter of Thomas Clap, President of Yale College from 1740 to 1766. She was a woman of rare qualities and entered with great ardor into the cause of independence, sustaining her husband with her brave and patriotic spirit throughout his military career. General Wooster, a native of Connecticut, was born in 1711, received a degree from Yale College in 1738, and then commanded the war sloop that conveyed the Connecticut troops in the expedition against Louisburg in 1745. During the French War in 1756, he was given command of one of the regiments raised by Connecticut for that service. In 1755, he was appointed the first Major General of the militia in his native state and held the position until he fell, mortally wounded by the British in their attack on Danbury, 1777. In the July 5, 1779. raid on New Haven, Tryon’s troops specifically targeted the home of Mary Clap Wooster. After throwing her furniture into the street and destroying it, they made off with two trunks containing the records of both her husband and her father. In her later years she lived in poverty and had to appeal to the legislature for relief. Mary Clap Wooster was born in Windham, April 25, 1729, and died in New Haven, June 6, 1807, at the age of seventy eight. 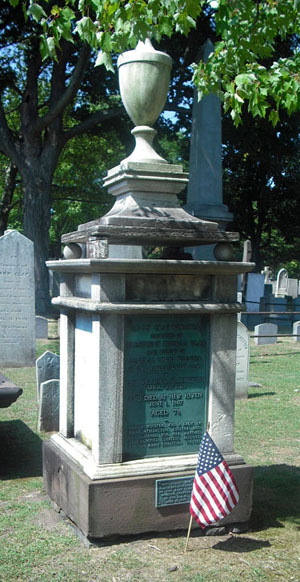 She was buried in Grove Street Cemetery in New Haven, where a simple monument stands in memory of her noble life. The Mary Clap Wooster Chapter of the Daughters of the American Revolution was organized on April 21, 1893. 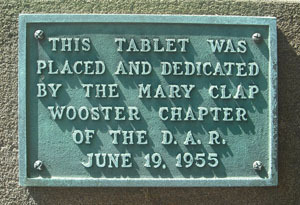 Above, a tablet placed by the Mary Clap Wooster Chapter on the grave of our namesake.